What is a delegate in C# ? A delegate in C# is a class that holds pointers to one or more methods for later execution. It’s a wrapper that provides dynamic invocation on the stored method references, both synchronious and asynchronious, along with some related meta-information. In its simplest form, a delegate is just a pointer to a function. Why were the delegates introduced ? The delegates in C# were introduced in order to allow the developers to use techniques from the functional programming world in the procedural environment of the .Net platform. For example, the delegates can be assigned to a variable and passed as function parameters, effectively making them “first class citizens”. That way, the inner workings of the methods can be replaced “dynamically” in a very elegant and effective way like, for instance, in LINQ, which is based on anonymous functions, extension methods and delegates. This forms the very basic implementation of a delegate that derives from System.MulticastDelegate and System.Delegate, respectively. The method Invoke() calls the actual stored method, which in this case should be declared with two parameters of type integer. The other two methods – BeginInvoke() and EndInvoke() – are used in an asynchronous scenarios, when you need to execute the stored function in a different thread than the calling one. 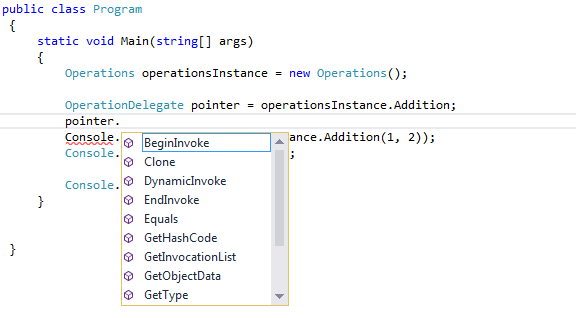 If you explore the intellisense output on the delegate, you’ll notice that it contains a number of additional methods. When you invoke the delegate implicitly or explicitly, all the stored methods will get invoked. The snippet above uses operator overloading, which is a really cool feature that originates from C++. Some of them have similar declarations, but they are semantically different. Namely, if you want to point to a predicate, you’ll use the Predicate<T> class, even if there is a Func<T1, Result> that takes practically the same arguments. What are the events in C Sharp ? We have the Operations class that performs some business logic and that we want to observe (which is basically an implementation of the Observer pattern using the latest .Net features). We see the delegate member, which is declared as private and, we see a pair of accessors – a getter and a setter. So, what are the events after all ? a compile-time error will be thrown. In fact, the IDE itself will warn us before that. If you take a look on all the standard Microsoft event implementations, you’ll notice exactly this pattern. It decouples the event declaration from the actual parameters passed, making them more orthogonal. Pointing to methods, using them as variables and passing them through functions is in fact a very powerful technique. Although I would not use a pure functional programming language for everyday use, I do admire the benefits that come from this hybrid approach. In this article, I’ve made a brief overview of the delegates in C#, which are critical for understanding the inner workings of LINQ. In my next articles on the topic, I’ll talk about Anonymous functions and Extension methods.